Pope Leo IX was the first pope who worked for reform in the Church. He was born in 1002 and given the name Bruno at Baptism. He was educated at a school for the children of Germany’s royal families and taught by the bishop of his diocese. As a priest, Fr. Bruno served at the cathedral before being named bishop of Toul. Twenty years later, Bruno was appointed pope, but he would not accept leadership over the Church until being approved by the priests, bishops, and people of Rome. After the long journey, Bishop Bruno arrived in the holy city dressed as a simple traveler. He was greeted by cheers at his humble manner and was immediately accepted by everyone as the new Holy Father. Bruno took the name Pope Leo IX. Leo quickly called attention to two issues badly in need of reform: simony, the buying and selling of sacred offices and things; and the practice of priestly celibacy. Some men had actually paid money to be appointed bishops. Leo quickly removed these false successors to the Apostles and appointed men who truly had the gifts necessary to lead a diocese. Other men simply ignored the Church’s tradition of priestly celibacy. They married and had families. Their family responsibilities made it difficult for them to serve their parish or diocese with all their hearts. Pope Leo did not just write letters or give sermons to announce his reforms. He traveled to major dioceses to conduct meetings and discuss why the reforms were necessary. 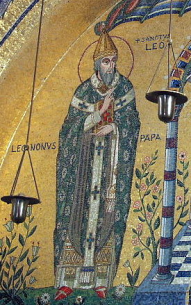 He traveled so much that he was nicknamed the “Apostolic Pilgrim.” Leo also appointed men who believed in the reforms to important Church positions. Leo knew that the changes he wanted would not be accomplished in his lifetime. He trusted the men he appointed to carry out the needed reforms and they did. Pope Leo’s mission to reform the Church reminds us that we sometimes stray away from living as Jesus wants us to live. We need help to begin again to live as followers of Christ. We can receive that help through prayer, through the sacraments, through the presence of the Holy Spirit, and the guidance of the leaders of our Church.